Yitzchok Saftlas is the Founder and CEO of Bottom Line Marketing Group, a premier marketing agency helping hundreds of corporate, political and non-profit clients build their brands since 1992. Mr. Saftlas leads a team of marketing experts in helping clients utilize a range of media to build their brands and grow their businesses. Highlighted campaigns and clients include: NYC Mayor Michael Bloomberg, L&R Distributors, Dirshu International, Teach NYS and many others. 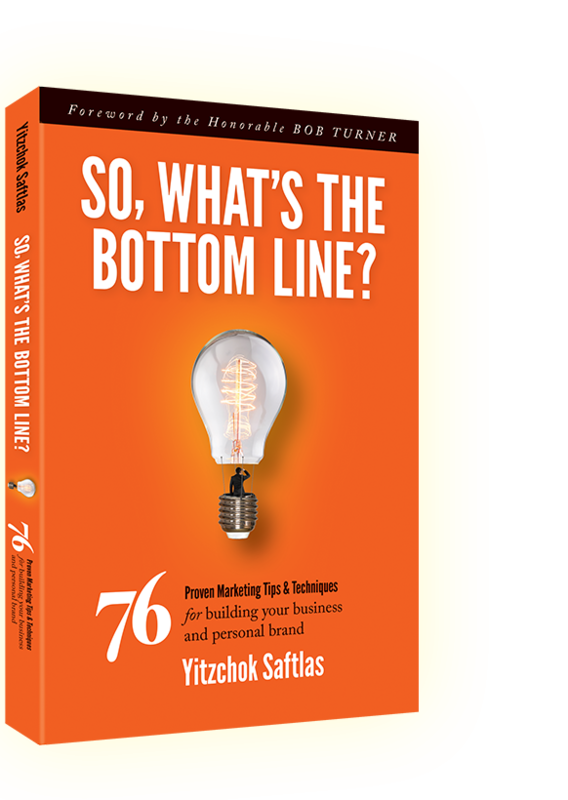 Yitzchokâ€™s new book: â€œSo, Whatâ€™s The Bottom Lineâ€ released by Morgan James Publishing, contains timeless advice for marketers, seasoned executives, and entrepreneurs. He also hosts a weekly business radio show, â€œMind Your Businessâ€ which airs on 77WABC in the New York / New Jersey metro area radio every Sunday night.